Thousands of travelers were scrambling and commuters were re-thinking their plans Wednesday after a deadly Amtrak derailment in Philadelphia shut down a critical section of the busiest railroad in North America. The crash choked Amtrak's Northeast Corridor, which carries more than 750,000 passengers a day between eight states and the District of Columbia, on Amtrak and eight commuter rail lines. Amtrak warned there would be no service until further notice between Philadelphia and New York, and that service elsewhere in the region would have to be modified. Most commuter railroads in the Northeast were operating normally, although many lacked the usual Amtrak connections. Four freight rail operators also share the railroad. "There is no circumstance under which there would be any Amtrak service this week through Philadelphia," the city's mayor, Michael Nutter, said after viewing mangled tracks and downed wires at the crash scene. Some 2,200 trains a day normally use the Northeast Corridor, according to the railroad's Infrastructure Operations and Advisory Commission. Amtrak said it alone carried 11.6 million passengers through the Northeast Corridor in fiscal year 2014, its highest ridership year yet. Many travelers found themselves offloaded far from their destinations Wednesday morning. 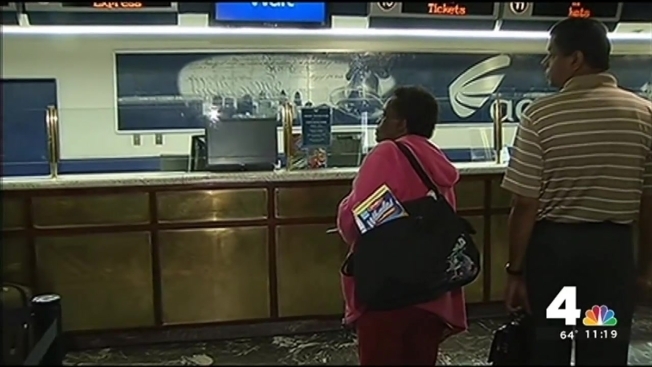 Airlines added flights and bus lines said they would honor Amtrak tickets, but some struggled to find seats. But there were no flights available from LaGuardia or Kennedy, so he was thinking about taking NJ Transit as his next step. "I think I'm going to get to the Newark Airport and just stand in line," he said. Wednesday afternoon flights between New York and Washington quickly sold out on Delta Air Lines, which was considering adding flights and switching to larger jets in both directions, spokesman Anthony Black said. American Airlines, which normally flies the other shuttle route through its US Airways brand, was adding two round-trip shuttle flights later Wednesday. NJ Transit, Greyhound and Megabus were honoring Amtrak tickets. Greyhound said it added 16 more scheduled trips between New York, Philadelphia and Washington. Megabus said it was working to add trips on Wednesday and accommodate an increased demand in coming days. At Union Station in Washington, dozens of people waited to talk with Amtrak agents as electronic boards showed trains to Boston and New York cancelled. ``We want to get home,'' said Wilhelmina Green, 66, who boarded a New York-bound train in South Carolina Tuesday night with her sister Dorothy Archbold-Wright, 68. They expected to arrive Wednesday morning, but were offloaded in Washington instead. Several dozen others waited in other lines to get bus tickets as television screens showed images of the derailed train. "My only disappointment with Amtrak is that they just leave you hanging," said Jane Scarfo, whose train trip from Florida to New York suddenly ended in Washington. Several passengers complained that Amtrak didn't help them make alternate arrangements. Scarfo said she was eventually able to book a Greyhound bus for later in the day. It wasn't clear Wednesday how long it will take before trains can run again through the accident scene, and what the economic impact will be therefore. The commission estimated that an unexpected loss of the entire system for just one day could cost the economy nearly $100 million in extra transportation costs and lost productivity. More information can be found on Amtrak's blog. Contributors include Associated Press writers Karen Matthews and Scott Mayerowitz in New York, Sarah Brumfield in Washington and Michael Rubinkam in Pennsylvania.